Architecture/Landscape/Interiors (A/L/I) Seniors Shadi Hashemi’s, Merve Onur’s and JuSung Park’s project CYNOSURE won 1st Place in the A/L/I Fall 2014 Charrette Competition! 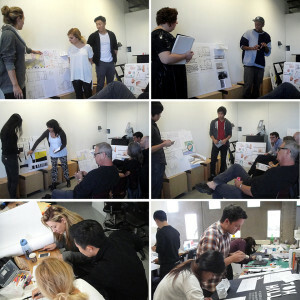 Each semester, A/L/I students participate in a charrette, which is a design project completed within a limited amount of time and no prior knowledge of the requirements. Solutions must be presented “by hand,” with no use of computers. A jury of A/L/I instructors reviewed the (blind) entries and chose four finalist teams. Finalists verbally presented their projects to the jury, after which the jury publically deliberated and determined 1st, 2nd and 3rd Place, and one Honorable Mention. Beside CYNOSURE, entries included Fishbowl, Revolution, One Nation Under Media, Code 11, and others. In the winner, CYNOSURE, the site’s interior and exterior spaces were connected with one continuous public space for the debates and interaction, that could be entered from three points on the building’s two street facades. See more images in the gallery, below.